“Chaque pain a son fromage”, meaning: every bread has its cheese. I often used this French saying in a romantic context, to motivate my friends when a relationship went sour. Your cheese will come, I would say. My best friend usually followed with : “I love cheese! Where is my cheese already? 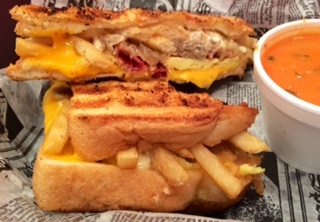 !” Well, New York Grilled Cheese has it, at least in the literal sense. 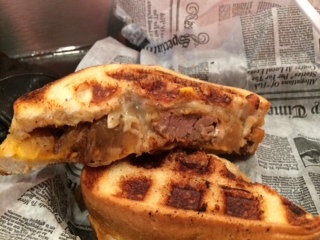 Hidden in Wilton Manors, New York Grilled Cheese (NYGC) is dedicated to grilled cheese sandwiches, evident through its name, with a casual and playful setting. 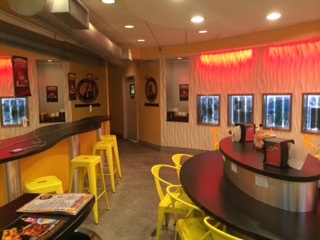 The locale was once a frozen yogurt shop, therefore the restaurant maintained the open floor layout, as well as the bright colors. The room was consequently very inviting and appropriate for a variety of age groups. We even made friends at the circular bar, while we waited. The wait built anticipation and certified that this was NOT fast food. My guest and I were bold enough to order three sandwiches for the two of us, which was a bit overwhelming to be frank. But being overwhelmed by food is just the type of overwhelming I like. Like my friend, I too adore cheese, but NYGC dares to add untraditional ingredients like sriracha, fries, egg and brisket to name a few. What a pleasant surprise! 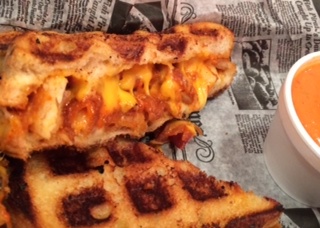 All sandwiches are waffle shaped, and served with a creamy tomato bisque. I could have enjoyed the soup solo, as it did not compare to the canned tomato soup served at your high school cafeteria. If it were plated in a porcelain bowl, it would have been suitable for fine dining. To return to the three sandwiches, we started with the Wall Street Grindr Award with cheddar, French fries, bacon, caramelized onions, garlic butter, fried egg, and dill pickles, served on a country loaf. It was the perfect balance of crunchy and oozy. Despite the numerous ingredients, it was enjoyable until the last bite and was my favorite of the bunch sampled. I was astonished by the fries peaking out and by the fact that each ingredient fit perfectly. However, what brought the dish together was the soup. Dipping the sandwich in, almost led to hums from the heavens. I am not sure why I took so long to submerge my sandwich, but that bisque put mayos, aiolis, and sandwich spreads everywhere, to shame. The MPD melt followed. Short for Meat Packing District. These words stress the sandwich’s hardiness with contents of American cheese, cheddar, beef brisket and caramelized onions. It was thick enough, yet refined enough to be a grilled cheese. Although the beef was a bit bland for my taste, it was a manly and packed melt. I was impressed by the view but not as much by the performance. The Yelp certainly put on show, however. I imagine it was named after the website and the filling lived up to Yelp’s popularity: fried chicken, sriracha, bacon, cheddar, muenster, and a pepper jam sauce. That sandwich led to a Kung Foo match in my mouth due to the flavor explosion. The crunch, the spice, and the salt woke me up immediately and led to a second bite, then a third. In fact, it may have been one of the most impressive sandwiches I have tasted, due to its complexity. Unfortunately, all great things come to an end, thus the martial arts session came to a halt. Perhaps my taste buds were exhausted. Midway through the Yelp, I felt the need to end the games early as the flavors became, excessive. I am shocked at my own words, as I am one who can never get enough. The Yelp was certainly delicious, but best enjoyed in smaller portions maybe. I used a Belgian ale as an appropriate referee to these three rounds, from a choice of other craft beers and wines. Not to shabby for a grilled cheese joint. Thank you to my “cool” friend- you know who you are- for leading me to this hidden treasure, with gems all below $10. To all my sandwich lovers, a visit is a must! I would like to introduce a scoring system to the blog, to help readers better understand my position. After each article, I will assign a score of 1-10 (ten being highest), with the possibility of half points when merited. This is not to be crude, but rather to summarize my opinion. Managing a restaurant takes hard work, and I would like to thank every establishment mentioned in Tasting It Like It Is, for its services during my visit.